From a very young age I remember holding a certain mystique for Scientific American magazine (some people in the know affectionately call it “SciAm”). The magic started when I was a kid and would go next door to swim in the Lieberman’s pool during the long summer vacation months. My younger and very good friend Ben would graciously invite me over for hours of refreshing enjoyment, a respite from those sweltering hot San Fernando Valley summers. This is the same pool I learned the art of swimming so I have much gratitude. But I’m also thankful for something more significant now as a Physics Groupie. This is when I was introduced to Scientific American. Ben’s father was a psychiatrist and maintained a subscription to SciAm. I recall seeing a whole shelf in their living room library devoted to back issues of SciAm. I was oddly drawn to those magazines. They represented knowledge beyond what I could comprehend. I always wanted to sneak a peek in them. But at 10 years old, I would look at the pages in amazement and not understand anything. I secretly dreamed of the day when I could read a whole issue and understand everything. I guess that day has come. SciAm is my starting point each month for developments in a wide variety of scientific fields. And yes, if I put my mind to it, I can pretty much understand any article, although the life science topics are sometimes a challenge because I never took college level chemistry or biology. I think that SciAm should be a requirement for any Science Lifestyler. If you wish to get a monthly dose of leading-edge research and trends in science, this is the magazine for you. I’m especially excited about SciAm issues that contain a feature about astrophysics, cosmology, or planetary science. Sometimes SciAm puts together “collection issues” centered about a specific topic. 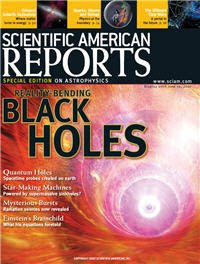 My recent favorite was the issue about black holes. SciAm can be fun too when used as a social tool. Zoe, my girlfriend and science companion extraordinaire, and I frequently settle down at a nice restaurant with a copy of the recent issue and discuss the various articles and news items. It can break the boredom on long flights as well. A science family can really benefit from a SciAm subscription. Parents can select a few articles each month to discuss at the dinner table, or science vacations can be planned around visiting science destinations across the country or the world. Finding a new issue of SciAm in my mailbox always brings a smile to my face each month. Pick a copy at a newsstand. I guarantee you’ll become enamored too! I agree... while many general science magazines have come and gone in my lifetime, Sci.Am. just keeps going and going with quality writing/reporting, and interesting stuff in every issue. I don't know how they're faring in this day of fading science journalism, but hopefully they'll be around well into the future. I LOVE sciam too! I read it on the Bart here in bay area. Great articles.